My first audiobook of the year (yes, I'm behind on reviews!) was The Parker Inheritance by Varian Johnson, a middle-grade novel that I'd heard good things about. This award-winning novel combines history, mystery, and realistic fiction. Twelve-year old Candice is stuck in boring Lambert, South Carolina, with her mother for the summer. They are staying in her grandmother's old house, while their own house in Atlanta is being remodeled. Candice doesn't know anyone in town, and her mother is often busy writing novels, so Candice spends a lot of time reading and making trips to the library for more books. Her summer improves considerably after she meets Brandon, who lives across the street and is just as much of an avid reader as she is. The two begin sharing books and soon become friends. When Candice discovers a mysterious letter in the attic, inside a puzzle book her grandmother left for her, their summer suddenly becomes much more interesting. The letter outlines a mystery and treasure hunt surrounding a woman named Siobhan Washington who lived in Lambert decades ago. Apparently, there was some kind of incident and a string of injustices, which led the letter writer to hide a treasure somewhere in town. Candice's grandmother tried to follow the clues and solve the mystery, but she failed (publicly), so now it is up to Candice and Brandon. As they slowly solve the puzzles and figure out the clues, they learn all about the town's history, including some shameful secrets that have been buried for too long. This suspenseful, educational, and entertaining novel has been compared to The Westing Game - and in fact, that classic children's mystery novel is a part of the story, as Brandon explains the similarities to Candice. I've never read it myself, but I remember my son (who "hates" to read) reading it for school and loving it, telling me all about it. This modern story has that same sort of mystery leading to a hefty inheritance, but here history and current issues facing kids are woven into the story. Young readers will learn all about Jim Crow laws, segregation, and discrimination in the South in the 1950's and 60's, alongside the protagonists. Meanwhile, Candice and Brandon face their own problems, including bullying, parents' divorce, and more. 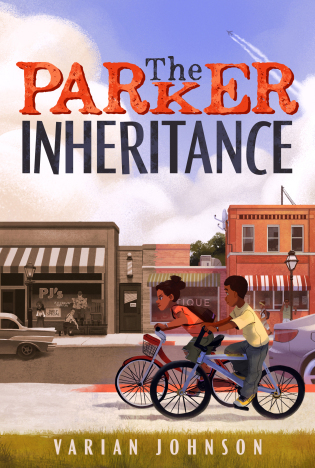 I listened to The Parker Inheritance on audio, and thoroughly enjoyed it, with the narrator's distinct (but easy-to-understand) Southern drawl making me feel like I was in the midst of the story. It's a complex but fast-paced novel that moves along quickly as the two new friends try to solve a decades-old mystery. Or you can order The Parker Inheritance from Book Depository, with free shipping worldwide. This book sounds like a joy to read or listen to. I like that it's a middle grade novel that doesn't deal with gangs, drugs, dating, etc. It was a lot of fun - though it also dealt with some serious issues, like racial injustice and bullying. I gave an extra copy I had to my cousin's daughter - waiting to hear what an actual middle-grade reader thinks!